"We made a wise decision having our kitchen remodeling by Bowen. We were pleased with the salesperson’s professional, attentiveness, and we trusted her. The foreman was the perfect professional and overall good guy. His craftsmanship and skills are unmatched. How owned the project. We were happy with the family mentality and spirit. We felt part of the family!" "We were extremely pleased with the job. Their knowledge and professionalism was exceptional, as was their patience in working around a 3 year old, 2 dogs, and 2 adults on a daily basis." "I would like to thank the entire Bowen crew for the wonderful work performed on our bathroom. From beginning to the end it was a positive experience. You did an excellent job explaining options and making suggestions, and with your frequent follow ups. The crew that worked in our home also did an outstanding job. Not only was the finished product professionally completed, but during the entire project all of them treated our home with care and respect. One of the most important things to me was the fact that your company did what you said you would do, when you said you would do it. They can in and got the project done with no excuse or delays. I will certainly give Bowen a call if we decide to have work done on our home. " "The entire staff was pleasant, friendly, and very professional. Everything was done efficiently including all of the work. The workers knew what had to be done and got right to it without hesitation. Your painter is an artist. His painting, sanding, and priming is amazing." "Bowen has consistently provided quality home improvement service in the many years that you have helped us. We will not hesitate to endorse your company on painting, home repairs, flooring, and bathrooms. " "Crew is friendly, careful, skilled, dependable, clean, and timely. They were concerned that we were pleased with their job. They kept us updated on what to expect next. They explained what they were doing and what had to be done. Excellent crew with good skills." "This company is the best we have ever used. A dream experience. Starting with the design, they were knowledgeable about products and gave sound advice on the best product for the money. They didn’t try to upsell us but told us when we could save money on a different product. They thought of all the little details that make the finished project have all the conveniences that we didn’t think to ask for. Their showroom display is excellent where you can actually see the quality of the products you are ordering. They started the work when they said they would and came everyday until it was finished. Their employee’s were professional, neat, skilled, polite, and cleaned up after themselves everyday. Their time estimate from start to finish was accurate. We can’t believe we found them. I would highly recommend them. " "Outstanding work, highly professional, and reliable. Outstanding customer service and communications. Workers are highly skilled, motivated, and do an outstanding job. Recommend Bowen without reservation." 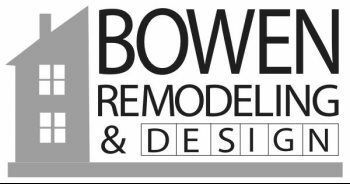 "Bowen Remodeling provided a first class high end bathroom for an extremely reasonable price when you compare products and quality of workmanship. I don’t think you would find a better deal or contractor. " "Excellent service and the work is fantastic. We have used you guys several times and are always pleased. I never would consider another company." "Communications were timely and clear. We felt valued in the process. The salesperson kept us informed at every step. The foreman would tell us at the beginning of each day what he thought he would accomplish and review the same at the end of each day. We really appreciate the promptness and politeness of all who were on the team remodeling our bathroom. They wanted to do their best work for us, for the company, and for themselves. They took pride in the work in our home. "